Rosie eating her favorite plant. Last summer when the cubs were still within the electric fenced enclosure beside our cabin, we were very careful about not only what we fed them but how they would associate their food with us. We never gave them anything from our hand. We decided on a diet of milk, porridge with a few sunflower seeds at the beginning, gradually increasing the percentage of sunflower seeds as they grew through the summer. This mixture was placed in their black bowls which they would always run to when they were hungry as if begging the black bowls to give them something to eat. We consequently have never experienced our cubs approaching us at any time begging to be fed. Charlie and I thought this out very carefully as we feel food association with us must be avoided for the success of our research in living without conflict with our bear offspring as they proceed into adulthood. When visitors come here they are amazed that the cubs do not approach them looking for a handout. 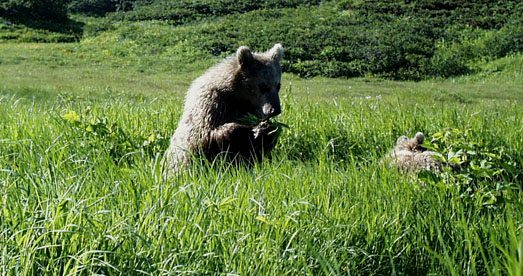 We chose sunflower seeds, which we had shipped to Petropavlovsk from central USA, as this animal food closely approximates the protein level of the pine nuts we know will become a big part of their diet in the wild. I was constantly worrying about how our cubs would make the transition from what they received in the black bowls and what they would know to eat of the vegetation of the surrounding countryside. We thought we would have to show them what to eat. Instead, they introduced us to a beautiful array of plants which now make up the major part of their diet. We estimate about 20 different species make up the majority of the vegetarian part of their diet. 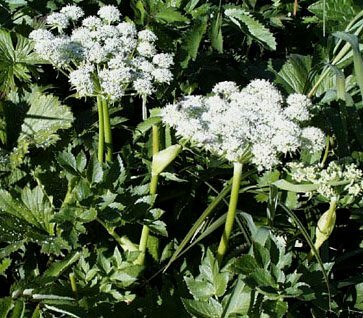 The spiky leafed plant with the white flower that approximates Wild Parsnip in appearance is their favorite. They walk along the shallow waterways crunching the stems mostly, spitting out the leaves, finishing with the white head of the plant, leaving the sweetest part to the last. An aroma like spearmint wafts by in the wind accompanied by the crispy crunch of three sets of teeth at work. 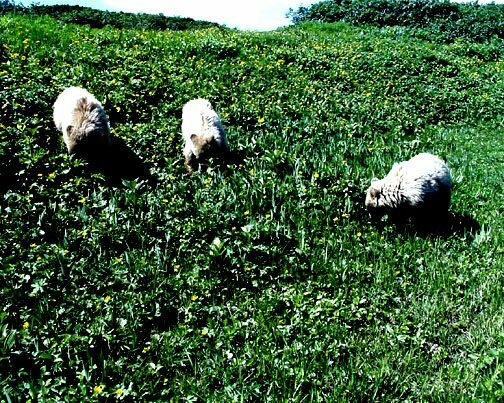 Climbing out of the lush waterways, they proceed to graze like sheep. Actually they are eating some of the many varieties of Sedge that are abundant here. They also nip off the yellow blossoms of the Globe flowers which have turned the hillsides yellow with their abundance these past two weeks. It has always horrified me to see them eat flowers as I love blossoms visually. Thankfully they no longer eat many of the white Rhododendron blossoms as this blossom is a favorite of mine. From the beginning they seemed to know instinctively what plants were edible. They avoided all blossoming plants with purple flowers! They dig up the roots of the vetch family. They love Solomon's Seal and Horse Tail. They eat something the Russians call Bear Plant which also grows along the waterways. Katja, a fish biologist at Kurilskoye Lake makes a wonderful soup using the leaves of this Bear Plant. To our surprise, the cubs do not eat the wild garlic, which is a favorite of Charlie's and mine. We had thought that what humans would like, bears would probably enjoy. It comes up as soon as the snow leaves by the lakeside. It is not like wild onion. It looks more like domestic green onions with green leaves and tastes like garlic. Our Russian friends showed us how to use it in stir fry, raw with salt (and a nip of vodka), in soup, in salad with mayonnaise. Other than the berries of fall and the mushrooms in a wet year, we eat no other wild plants. We are too far from medical help if we chose the wrong one. Biscuit eating dead flies at the lakeshore. They are starting to appear anxious for some variety in their diet now. They are hungry for the fish diet which will soon dominate their diet as the spawning salmon begin to die in Kambalnoe Lake. Yesterday we walked by a lake where we noticed a pair of gulls with their chicks newly hatched swimming in the shallow water. It was a curious spot for two gulls to nest on top of such a small rock in shallow water. Chico smelt the fish they had neatly stacked nearby to feed the small young gulls swimming nearby. The three cubs ran out consuming the fish first and quickly catching and eating the chicks second. Sometimes wild nature is too much for me as I looked away. I am less squeamish about watching them dig out vole nests which they can smell one foot below their feet in the soft tundra. Nor does it bother me to watch them slurp up dead flies as they wash up on the lakeshore after a big wind. They constantly roll over rocks looking for other insects. I love joining the cubs on their excursions, sometimes crawling briefly on my hands and knees for a better look at what new tasty item they have discovered. This morning I was looking closely at a plant Chico was munching noisily. Something brushed my shoulder. Biscuit had come over to look at what I had discovered. I don't know who is teaching who here. I think the bears mostly teach us about their world. I feel lucky to be entering it.